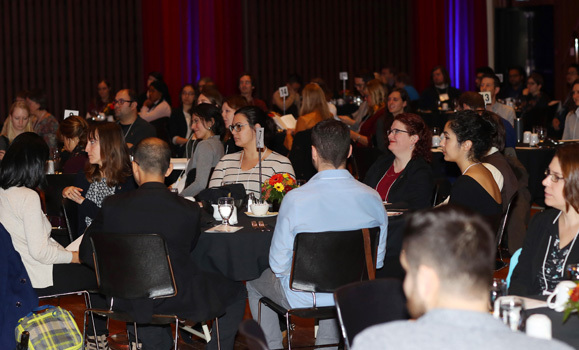 Members of the Dalhousie research community and beyond gathered earlier this month to celebrate some of Dal’s “best and brightest” as part of the annual Killam Trusts award ceremony. 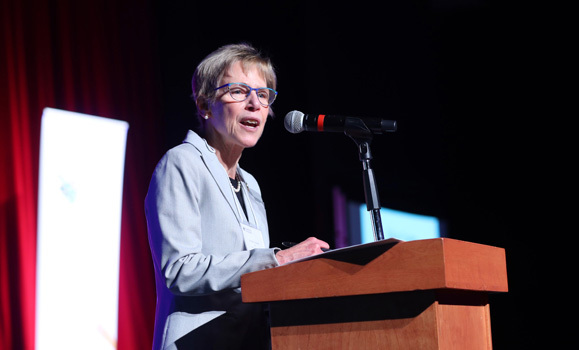 That’s how Marty Leonard (pictured below), dean of Dal’s Faculty of Graduate Studies, described the dozens of new and continuing predoctoral and postdoctoral scholars, Killam professors and chairs and prize winners recognized at the event. For 51 years, the Killam Trusts scholarships and fellowships have provided generous funding for Canadian researchers at Dal and select other universities and organizations across the country through its suite of scholarships, honours and awards. At heart, the Killam Laureates are those whose work focuses not only on supporting advanced study, but also ensuring that such studies work to improve the future of Canada. The program has provided funds to 1,783 Dal recipients and 5,378 students at other institutions across the country since it was first established in 1967. “The impact of the Scholarship fund has been phenomenal,” said Bernie Miller, managing trustee of the Killam Trusts. The scholarship has contributed tremendously to Dalhousie’s standing as a leading research institution, and its inclusion in the U15 group of Canadian research universities. The ceremony also included several short, 3-minute thesis style presentations from a number of current Killam Scholars.